Kamal Haasan goes gaga over Shah Rukh Khan’s humbleness! Shah Rukh Khan was flooded with birthday greeting on his 50th birthday but the most striking greeting that Badshah Khan may have received came from thespian of South Indian Cinema Kamal Haasan, who applauded SRK’s human stature and admired his humble nature which he has abided since beginning. “I salute his humility because frankly speaking such kind of humanity comes to most successful celebrates quite late in their career and Shah Rukh Saab has been abiding since beginning. A rare quality I must confess!,” he added. 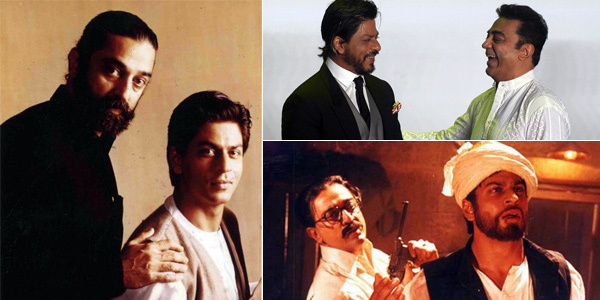 Recalling SRK’s humbleness Kamal Haasan remembered when he had approached Shah Rukh to persuade him to do a cameo in his movie HEY RAM (2000). In 2013 Kamal Haasan threw a party in Chennai to celebrate his career’s success journey. Shah Rukh Khan was a special invitee and he SRK made it a point to grace the occasion. “Though he was too was in suit but despite the heat he did not shy and made the party lively by his energetic dance and entertainment. That day, I must confess, I realized that he is a true Pathan and a born entertainer!,” he confided. 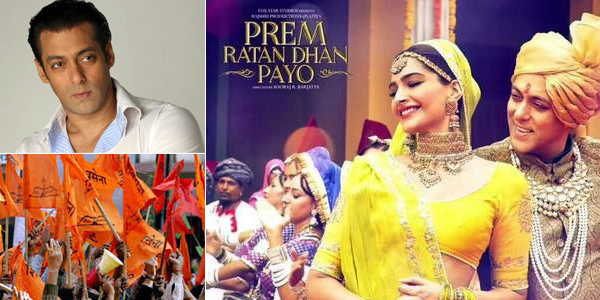 Is Salman Khan’s Diwali release PREM RATAN DHAN PAYO in danger of being jeopardized? It seems Salman Khan’s much anticipated Diwali release PREM RATAN DHAN PAYO is in danger of being jeopardized by Hindu fundamental groups as yet again Salman Khan has put his foot in his mouth! According to reports Salman Khan has taken the Hindu political group Shiv Sena by its horns and challenged their ban against Pakistani actors in Maharashtra. Though Salman Khan may be right as he is not the only one who has raised his voice against slamming of Shiv Sena's resolve to halt Pakistani artists from performing in Maharashtra but being a Muslim and his most ambitious film PREM RATAN DHAN PAYO on verge of release the fundamentalist may try to exploit the situation and mint as much publicity as they can!!! It may be noted earlier Shiv Sena had succeeded in banning Ustad Ghulam Ali's ghazal concert in Mumbai and had even threw ink on Sudheendra Kulkarni, who was the organiser of former Pakistan foreign minister Khurshid Mahmud Kasuri's book launch in Mumbai. 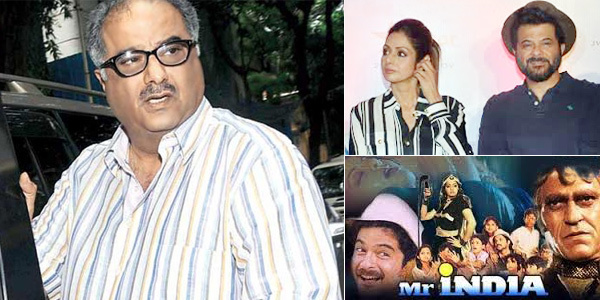 Is Boney Kapoor serious of making sequel of MR.INDIA? If MUGHAL-E-AZAM is the cult classic of 60’s and SHOLAY of the 70’s than definitely Boney Kapoor’s MR.INDIA holds the same status in the annals of Indian cinema. Since the past few years there has been consistent demand for the sequel of the super hit 1987 classic. Time and again Boney Kapoor and Anil Kapoor have assured of making a sequel but there don’t seem to be any progress besides assurances! Recently at the 17th Jio MAMI Mumbai Film Festival a small reunion of the movie’s stars was noticed with Anil Kapoor, Sridevi, writer Javed Akhtar and Boney Kapoor going nostalgic about the movie. Boney Kapoor, who was present on the occasion, assured the media about the making of Mr. INDIA 2. “Nevertheless, if I get a power packed script that excites me I will begin the sequel immediately minus Shekhar Kapoor because he is busy with his projects down the West,” he quipped. Shah Rukh Khan’s success is an inspiration for all! Surely Shah Rukh Khan is a ‘name to reckon’ not just in India but around the globe so much so that according to an estimate about 3.4 - 3.8 Billion people from across the globe knows the name ‘Shah Rukh Khan’! In nut shell half of the world population is his crazy about him and he is more popular than Hollywood superstars Brad Pitt and Tom Cruis!! November 2 marks his 50th birthday of the SRK; Raaga.Com wishes him birthday greeting and prays he continues to entertain for generations to come. Shah Rukh Khan popularly recognized as SRK and termed as Badshah Khan in Bollywood has come a long way in his career spanning more than two decades. Truly his raise to stardom is one of the most inspiring rags to riches tale. Truly Shah Rukh Khan had desperately tried to be an actor and in his bid to be a film star he even had to sleep on footpaths of Mumbai. He had to face many hardships including several rejections and days of starvation but it was his sheer determination that came to his rescue. After days of struggle he was spotted by noted actress and filmmaker Hema Malini, who first signed him for her film DIL AASHNA HAI but call it destiny or SRK’s fortune that her movie got delayed and his other film DEEWANA got first released in June 25, 1992. DEEWANA was super hit and fetched Shah Rukh Khan the prestigious Best Debut Actor of the Year Filmfare Award. Incidentally four months later Hema Malini’s film DIL AASHNA HAI released on October 23, 1992 and proved a major disaster! Had DIL AASHNA HAI released before than probably, today, Shah Rukh Khan would have been Mr. Nobody but as the axiom goes - Where there is Will, There is Way and as the stirring dialogue from his film OM SHANTI OM, when one is determined to achieve his goal than even nature plots treachery to help one reach his destination as it did in SRK’s favor!! Moral of the story - keep pursuing your goals with utter determination and success will follow you! !